Unlike other sports, athletics serves as an umbrella for a wide range of disciplines. While there is no mistaking what constitutes cycling, swimming, or football, an athlete can be a runner, a jumper, a thrower, or in the case of events such as decathlon a combination of the above. As a result, individuals thinking of taking up athletics are spoilt for choice. However, unlike other sports that are accessible to anyone who can find an expanse of grass, or can afford a pair of running shoes or a bike, athletic events require more specialised facilities. 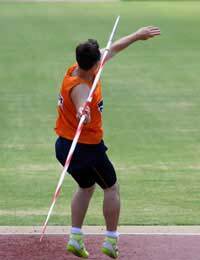 Of course, the hammer, or throwing the discus or javelin cannot be practised on the local field, while track disciplines such as the 100 metres by definition require specific marking when training over the specified distance. So joining an athletics club as an avenue into the sport can’t be stressed too highly. Individual clubs offer differing levels of facilities, but most will have both an indoor complex as well as a synthetic surface outdoors together with a safe area for field events. For more information and the location of a club near to you, visit ukathletics.net. But the benefits of a more professional environment in which to practise sport is only part of the story. The other essential element in helping individuals perform to the maximum is a good coach. Again, this is where the club can aid development, whatever the ability of an athlete, whatever the level that they are aspiring to reach. Many people believe that the attentions of a coach are only reserved for serious competitors with one eye on the next Commonwealth Games, or the Olympics. But that simply isn’t the case. Only a tiny fraction of those involved in athletics are ever going to reach this level, however much effort they put in. The majority enjoy it for the greater sense of physical and mental well-being the exercise gives them, and the sheer thrill of getting involved. A good coach should be as comfortable handling more “casual” competitors as he or she would be with an elite individual or group. In addition to groups defined on ability, clubs will also offer separate sessions for veterans, women and children. This means that not only are these athletes made more comfortable by being among their peer group, but they are better able to assess their own level of performance because they are in direct competition with those of a similar age and physical development. The added bonus of joining a club is that they provide a wonderful forum for mixing with like-minded individuals and making new friends. These new friends may, in turn, point you in the direction of disciplines that you would never have considered had you not joined. For example, middle distance or cross-country running may have been the main source of your original interest, but a few sessions with a shot, or a throw of the javelin, may reveal a natural ability for such an event. In terms of cost, joining fees tend to be relatively modest, and many clubs offer discounts for individual groups such as the over 60s and the unemployed. Weekday training sessions tend to be held in the evening to take account of the demands of most people’s working schedule. So there really isn’t any excuse not to get involved. Remember that you don’t have to have a gold medal round your neck to be a winner.